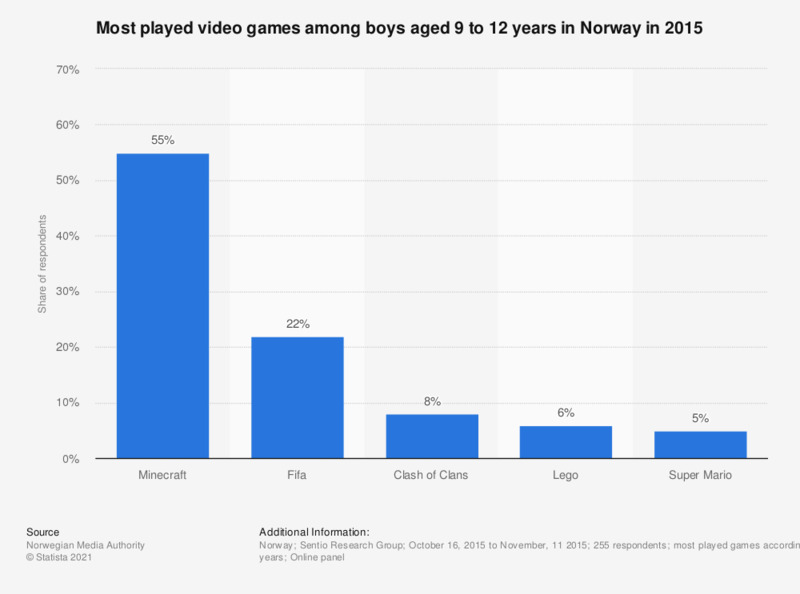 This statistic shows the result of a survey on most played video games among boys aged 9 to 12 years in Norway in 2015, according to their parents. The sandbox video game 'Minecraft' was most popular among boys aged 9 to 12 years (55 percent of children). 'Fifa' (22 percent of individuals) and 'Clash of Clans' (8 percent of respondents) ranked second and third respectively. The source does not provide any information on possible additional answering options during the survey. Statistics on "Video games in Sweden"
Video games market in the U.S.
Do you have access to Xbox, Playstation or Wii? How often do you play online games? How often do you play video games on the internet? Has your child played a game with an age limit of 18 years? To what extent do you agree with the following statements about games? How often does your child play video games in the leisure time?